Ice cream is good. On Pasture author Troy Bishopp loves it, and a lot of us like it too. 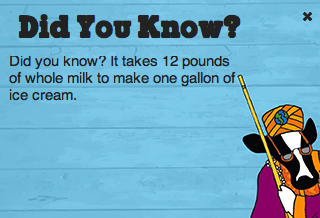 We like it so much that the average American eats more than 5 gallons per year! Conefucius provides interesting facts and tips at the Caring Dairy website. One of the cool things about eating ice cream is that it’s a dairy product, so you can check off your daily requirements for that part of the food pyramid. If you’re picking your frozen delicacy, you might have a local ice cream that tickles your ice cream bone. If you don’t, it turns out that when you pull out a pint of Ben & Jerry’s you can also pat yourself on the back for supporting sustainable farming. 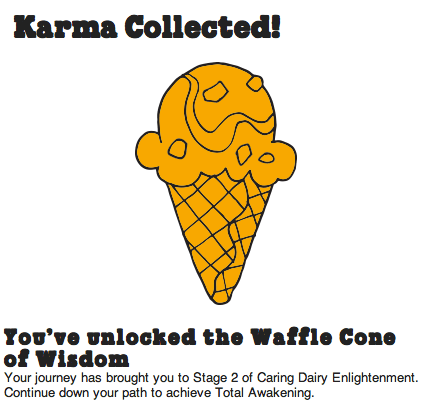 Ben & Jerry’s has this really cool program for their dairy farmers: the Caring Dairy program. Through the program, the dairy farmers evaluates their management and practices, and Ben & Jerry’s supports them in their efforts to sustainable agricultural practices with education and compensation. There’s a fun website to explore that explains the program with travel guide Conefucius, the very wise cow. A tour down the path of Caring Dairy Enlightenment describes how farmers are continuously improving practices on their farms in eleven areas including energy and nutrient use, pesticide use, animal husbandry, biodiversity and farm economics. Even if you’re not in the Caring Dairy Program, there might be some tips that would help you on your own operation. And there’s the added bonus that as you go along you’ll collect Karma points like the one on the right. Kathy got a kick out of it, and we think you will too. So, take out your spoon, pick your favorite flavor, click, lick, and enjoy! Go ahead, Click, and start down the path to enlightenment!